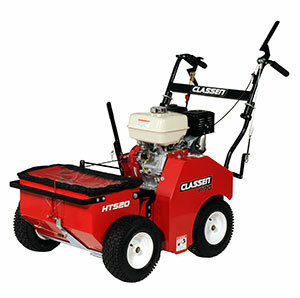 Classen released the new Pro HTS20 Hydro-Drive Overseeder. The self-propelled machine provides 13 seed rows in a 20-inch swath. The unit’s double-edge, double-blade reel spaces the blades a narrow 1.5 inches apart to provide greater than 15 percent more rows of seed than competitive units, the company said. Depth can be set in any of 10 settings from 0 inches to 1.625 inches. Classen’s Pro Overseeder features a 40-pound-capacity floating seed box that follows the contours of the terrain, whether it includes bumps, dips or uneven areas. The floating seed box also locks in place for hill or slope seeding. A seed agitator inside the seed box breaks up seed clumps caused by dew and humidity, allowing seeds to drop from the hopper through the seed box slits. The HTS20 features a hydrostatic drive. The 9-hp Honda engine offers operating speeds as fast as 3 miles per hour forward and 1.5 mph in reverse. This allows the machine to cover as much as 26,400 square feet per hour, according to Classen. The Pro HTS20 Hydro-Drive Overseeder comes with a two-year commercial and rental warranty.